A terrarium is equal parts living art and landscape. 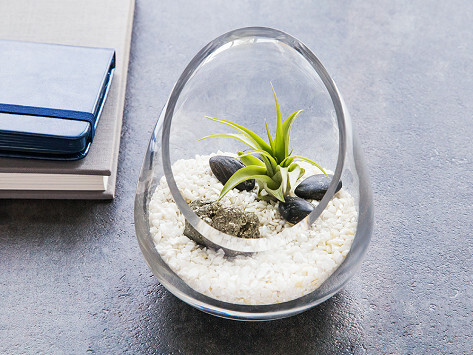 This cut-glass vessel is simple but striking, and it houses a tiny garden of pebbles, moss, a crystal, and an easy-to-care-for air plant. It’s a low-maintenance, attractive way to bring a small dose of green indoors. Dimensions: 4" D x 6"
It is really pretty and is exactly as pictured. Creative & unique idea to brighten an area with an almost no care piece of beautiful eye-catching art. 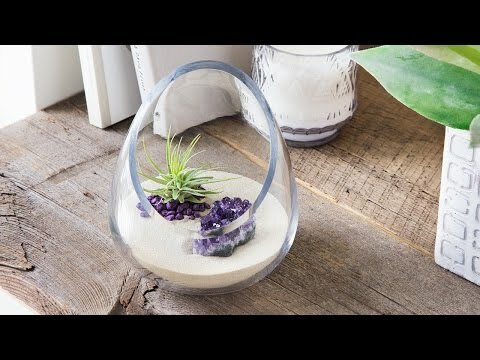 The air plant is so easy to careo care for and the sand, rocks, moss can be re-arranged in countless ways.